The Israelites didn’t always agree with Moses, but he was their leader. And he had been gone far too long—at least for their liking—up on some mountain top with God. So because he was “delayed” in coming down (Ex. 32:1), the people got up and got to work on their own. They asked (pressured?) the next in command, Aaron, to make an idol—a false god—to go before them. Big mistake. Aaron complied and made a golden calf. Bigger mistake. The people then held a festival including sacrifices and partying. Biggest mistake of all. Notice God’s response in verse 7. If the people thought Moses had been delayed in coming back, God would give them what they wanted and send him back “down at once.” But they would not like what he would bring with him: judgment. While the people thought too much time had passed, but notice God’s perspective in verse 8 is quite different: the people had acted corruptly “quickly.” And now God would destroy that stiff-necked people. I mention this difference in perspective of time for a reason: it reveals the hardness of the Israelites’ hearts. Perhaps some time had passed—we can even grant that—but no matter how much time had passed—even if it had been decades, centuries, or millennia—there is no cause to fashion an idol to replace God. None. Ever. This shows the power of sin over the Israelites, and us too. It makes us doubt, worry, and rationalize. I am sure that is what the people were doing that day. “Would Moses ever come back? What if he didn’t? What will we do? It’s best to take control of our situation then, and appoint a new leader—and a new God.” Doubt. Worry. Rationalizing. We don’t fashion golden calves most likely, but our idolatry is just as real. We too worship a litany of other things besides the one true God. Money. Popularity. Comfort. Ourselves. Sports. The list goes on and on. Yes, our idolatry is just as real and I would argue it is much more heinous. Why? Because we have the fuller gospel story that the Israelites lacked. Our vision is better, clearer, and yet we are blinded by our sin just as easily. Because of the hardness of our hearts. We are tempted to echo God’s burning anger against this people. It is safe to do that. It makes us feel better about ourselves. But when we read this account, our hearts should not cry for fire on the Israelites, but rather mercy for ourselves. It was the time with God—what the Israelites considered a delay—that surely positioned Moses to be in the correct heart posture to intercede for the Israelites. They had been a thorn in his flesh, but now he speaks up for them and appeals for God’s mercy and grace. Notice that God told Moses to go down at once, but what could be considered a delay—time Moses took to plead with God first—was what saved the Israelites. Don’t you just love the rich levels of God’s Word? 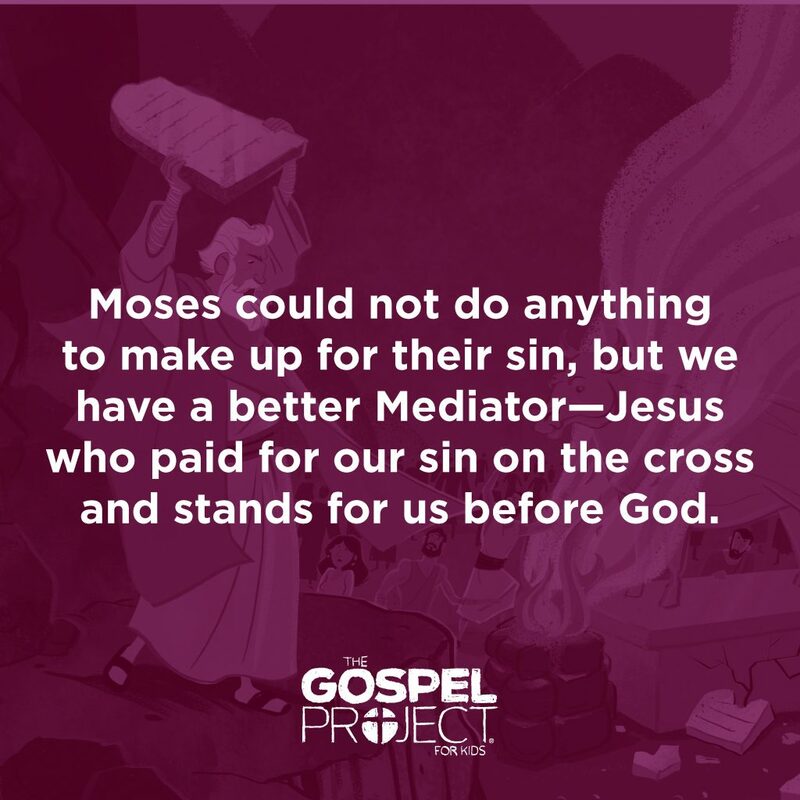 There was Moses, the intercessor, standing between holy God and sinful man. Sound like anyone else we know? That’s right, in this moment Moses provides us with a picture of a better mediator who would come, Jesus. We need to take idolatry seriously because God does. Idolatry is a crystal clear window into our broken and warped hearts. But thanks be to God for His matchless mercy and grace. Our sin is great, but His mercy is greater. God has given us an answer to the golden calves we build up for ourselves, a Lamb who laid down his life for us only to rise again and stand before God as our perpetual Mediator. Preschool Tip: Idolatry may be a new concept for your preschoolers. Be sure to take time to explain idolatry in age appropriate ways—that an idol is anything a person worships instead of God who alone deserves all worship. Kids Tip: Help your kids be transparent before God, and perhaps even one another, in determining what idols they have in their lives. Don’t think they do not have any! We all do, and the sooner we can help them admit this is the sooner they can see the beauty of God’s response to their idolatry in the person and work of Jesus Christ. Blaise Pascal, in Blaise Pascal: Thoughts, Letters, and Minor Works, ed. Charles W. Eliot, trans. W. F. Trotter, M. L. Booth, and O. W. Wight (New York: Cosimo, 1910), 330.